ST. LOUIS - No. 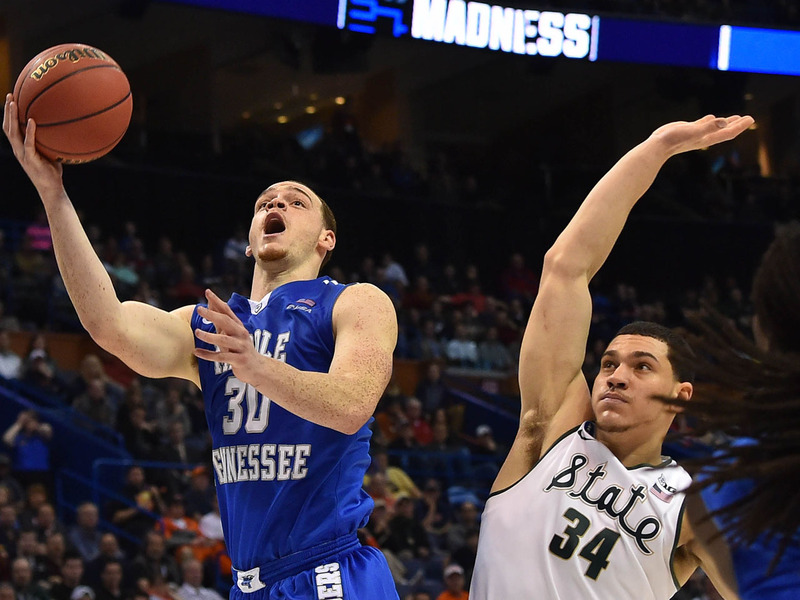 15 seed Middle Tennessee State sent the biggest shock yet through the NCAA Tournament on Friday, knocking off second-seeded Michigan State 90-81 in the first round. Reggie Upshaw scored 21 points to lead the balanced Blue Raiders (25-9), who shut down player of the year candidate Denzel Valentine. Middle Tennessee never trailed the Spartans (29-6) in one of the biggest upsets since the tournament began seeding teams in 1985. It was the eighth time a No. 2 seed lost to a No. 15, and first since Florida Gulf Coast beat Georgetown in 2013. The Eagles went on to reach the Sweet 16. Michigan State won the Big Ten regular season and tournament titles, and was ranked No. 2 in the country. Even as a second-seed, many picked them as favorites to win the East, in part because of coach Tom Izzo's postseason history. Matt Costello matched a career-best with 22 points for the Spartans, but it wasn't enough to offset Valentine's miserable afternoon. The senior had 13 points and 12 assists, but he also had six turnovers - one of them coming with the Spartans trailing 79-76 and less than three minutes to go. Giddy Potts added 19 points, and Darnell Harris and Perrin Buford scored 15 apiece, as the Conference USA champion Blue Raiders won their first NCAA Tournament game since 1989. They never seemed intimidated by the Spartans. They roared to a 15-2 leading in the opening minutes to silence what Michigan State fans were in the building, then slowly got Syracuse and Dayton fans on their side. Michigan State never managed to draw even throughout the first half. Valentine was saddled with two fouls and rendered ineffective, and the backcourt of Forbes and Eron Harris combined for four turnovers while managing a single point. NEW YORK - Adam Woodberry put back a missed shot at the overtime buzzer to give 7th-seeded Iowa a 72-70 victory over 10th-seeded Temple on Friday in the first round of the South Regional at Barclays Center. The Hawkeyes got the chance at the game-winner when Daniel Dingle of Temple, who played just 6 minutes and was in the game because Devin Coleman had fouled out a minute earlier, missed the front end of a 1-and-1. Jarrod Uthoff led Iowa with 23 points, while Peter Jok had 16 and Woodberry finished with 10. Quenton DeCosey, who made three free throws with 2.1 seconds left in regulation to tie the game, had 26 points for the Owls (21-12). OKLAHOMA CITY - Buddy Hield scored 27 points to help Oklahoma defeat Cal State Bakersfield. The senior guard made 8 pf 14 shots, including 3 of 6 3-pointers. Isaiah Cousins scored 16 points and Jordan Woodard added 15 for the Sooners (26-7), who made 11 of 20 3-pointers and shot 50 percent overall. Oklahoma enjoyed a homecourt advantage at Chesapeake Energy Arena, just a half hour's drive north of their Norman campus. The Sooners advanced to play No. 10 seed Virginia Commonwealth, which defeated Oregon State 75-67 earlier in the day. Aly Ahmed had 16 points and eight rebounds, Kevin Mays had 14 points and eight rebounds and Dedrick Basile added 13 points for Bakersfield (24-9), the Western Athletic Conference Tournament champions. The Sooners won, despite making just 15 of 25 free throws. SPOKANE, Wash. - Maryland needed a turnover in the closing seconds to ensure it would avoid a place with all the other top seeds that lost in the first round of this topsy-turvy NCAA Tournament, holding off South Dakota State behind a career-high 27 points from Jake Layman. Parks scored 22 points for the Jackrabbits. ST. LOUIS - Ethan Happ had 15 points and nine rebounds, none bigger than one he pulled down in the closing seconds, as seventh-seeded Wisconsin beat No. 10 seed Pittsburgh 47-43 in the NCAA Tournament on Friday night. Nigel Hayes had 12 points and Vitto Brown scored 11 for the Badgers (21-12), who advanced despite an awful shooting night. Hayes was just 3 for 17 from the field, Bronson Koenig failed to hit a 3-pointer for the first time in 44 games and the Badgers finished 4 of 19 from beyond the arc. It was still enough to knock off the equally cold-shooting Panthers. Jamel Artis had 13 points to lead Pittsburgh (21-12), which started the season 14-1 before struggling when it hit ACC play. Leading scorer Michael Young was held to six points and five rebounds. Wisconsin will play No. 2 seed Xavier on Sunday. NEW YORK - Thomas Walkup scored 33 points and 14th-seeded Stephen F. Austin faced down West Virginia's full-court pressure with some of its own in-your-face defense, pulling off a rugged, 70-56 first-round upset of the third-seeded Mountaineers Friday night in the NCAA Tournament. The Lumberjacks (28-5) ran the nation's longest winning streak to 21 games and will face either six seed Notre Dame or No. 11 Michigan on Sunday at Barclays in the second round of the East Region. The Mountaineers (26-9) and Lumberjacks played physical, chest-to-chest defense, contesting not just every shot, but every pass. Neither team shot better than 31 percent. Walkup, the two-time Southland Conference player of the year, took it to the teeth of West Virginia's defense and went to the line 20 times. He made 19, including two to make it 60-47 with 5:15 left in the second after West Virginia coach Bob Huggins' griping to officials drew a technical on the Mountaineers. OKLAHOMA CITY - Danuel House scored 20 points as Texas A&M pulled away in the second half to win its first NCAA Tournament game since 2010 with a 92-65 first-round victory over Green Bay on Friday night. The third-seeded Aggies (27-8) trailed by as many as eight points in the first half before using a 26-9 first-half run to take control on the way to a comfortable victory over the 14th seed. House was 8 of 12 from the field and hit a pair of 3-pointers for Texas A&M, which shot 56.1 percent (32 of 57) in the win. Khalil Small scored a career-high 22 points to lead the Horizon League Tournament champion Phoenix (23-13), who were making their first tournament appearance in 20 years, while Jamar Hurdle added 11 in the loss. SPOKANE, Wash. - Carrying the marquee for the underachieving Pac-12, No. 1 seed Oregon showed no nerves playing as a top seed and rolled past No. 16 seed Holy Cross 91-52 on Friday night in a West Regional first-round game. Chris Boucher led Oregon (29-6) with 20 points , while Dillon Brooks and Elgin Cook both added 11 points as the Ducks won their ninth straight and advanced to the round of 32 for the fourth straight season. With nearly all of the Pac-12 making a quick exit out of the NCAA Tournament, the Ducks used their overwhelming athleticism to quickly build a double-digit lead and never allowed the Crusaders to sniff a potential 16-seed upset. Boucher slammed a trio of lob dunks in the first 12 minutes and the expected blowout quickly developed. Robert Champion led Holy Cross (15-20) with 22 points off the bench. ST. LOUIS - James Farr had 18 points and 15 rebounds, fellow big man Jalen Reynolds added 12 points and No. 2 seed Xavier pulled away late for a 71-53 victory over pesky 15th-seed Weber State in the first round of the NCAA Tournament on Friday night. Remy Abell added 11 points and Trevon Bluiett had 10 for the Musketeers (28-5), who never trailed the Big Sky Tournament champs in advancing to play seventh-seeded Wisconsin for a spot in the Sweet 16. Weber State (26-9) was within 54-47 midway through the second half when Farr and Reynolds, both of them heftier than anybody on the Wildcats' bench, began to impose their will. The managed to power right through Weber State's back line for easy buckets, allowing the Musketeers to slowly draw away. NEW YORK - V.J. Beacham scored 18 points, including the 3-pointer that gave Notre Dame the lead for good, and the sixth-seeded Fighting Irish beat 11th-seeded Michigan 70-63 on Friday night in the first round of the East Regional at Barclays Center. Michigan (23-13) controlled the first half, taking a 41-29 lead. Notre Dame scored the first eight points of the second half, a run that included 3-pointers by Vasturia and Matt Farrell, matching the team's total of the first half. It brought the Fighting Irish within 41-37. Beacham's 3 with 4:24 left gave Notre Dame a 62-59 lead, one they never gave up. SPOKANE, Wash. - Isaiah Miles sank a 3-pointer with 9 seconds left to lift Saint Joseph's to a 78-76 win over Cincinnati in the first round of the NCAA Tournament on Friday after a dunk at the buzzer by the Bearcats was waved off. Octavius Ellis appeared to tie the game with his dunk as time expired, but officials after a lengthy review determined that the shot came too late. DeAndre Bembry scored 23 points and Miles finished with 19 to lead eighth-seeded Saint Joseph's (28-7). Twenty of Bembry's points were in the first half. Jacob Evans scored 26 points to lead ninth-seeded Cincinnati (22-11). Saint Joseph's will play top-seeded Oregon in the second round on Sunday. Oregon beat Holy Cross 91-52 earlier Friday. OKLAHOMA CITY - Paul Jesperson banked in a halfcourt shot at the buzzer to give 11th seeded Northern Iowa a 75-72 win over No. 6 seed Texas Friday in the first round of the NCAA Tournament's West Region.